Don’t you think you went too far? I meant that I think you went to far with a game that is supposed to be artistic and with several lyers, while in fact it’s plain simple with bad graphics and nothing new in gameplay, with title that suggest it’s something that it simply is not. I played it for more then 1 minute (I’ve done everything except that gold-finding part, it was too annoying) only because you made it and I am very dissapointed. That’s strange actually, but I’m still waiting for something from you that would be similar in quality to The Majesty of Colors and saddly no other your game was even close to it. Hmm, I don’t want to make you feel bad, I hope you don’t take such comments too personally. Ofcourse my opinion is not really important, I can’t make games at all. I think Froz means it’s too sureal? Or I dunno, thought the title was sick? Anyway, it was an interesting game. Not your best, but I wouldn’t give it so much hate like everyone on newgrounds is. I mean the mechanics are neat, but repetitive and the coin-collecting was just aggravating. Perhaps what annoys people is there no clear answer for them. I assume they want “okay, what happens to the world?” or “why do they [babies] dream of this?”; both of which are mentioned indirectly, but I guess its not obvious for some “ppl of the internetz”. The Newgrounds responses are very interesting. So far, this is my most divisive game: I have a bunch of 10s and a bunch of 0-3 reviews, with an average review score of 6.5/10, and a non-review score of 3.78/5. The responses are incredibly mixed. I played this a few hours ago. I enjoyed the central gravity mechanic quite a bit, but the gameplay was a bit repetitive, particularly the third thread with the coin collecting. Visually, it’s… interesting. A bit ugly, but the sort of primitive scribbles I’d expect from inside a newborn’s head. Finally, the first line didn’t really draw me in story-wise, and the third was interesting, but I started running out of steam fairly quickly with it. I found the middle story-thread pretty disturbing, though. I liked it very much. The central gameplay mechanic was original and I found the story told in the second thread compelling. Some of the platforming in the coin collection levels was very frustrating, but maybe that’s because I’m not great at platforming. Also, the art style was very apt. How did you make the levels for this game? I’ve been working a bit in flash but ultimately since I’m using flashdevelop I don’t have a WYSIWYG editor of any kind, and my ideas have to be a bit hamstrung because of it. I quite enjoyed the level design of this game, it feels consistent (with the central focus on the gravity axis thing, and the general symmetry of most of the levels), and it also explored the mechanics of the game quite well, considering how simple they are. That being said, though, I didn’t have the patience for the gold collecting levels – maybe bring the number of coins down to 1/10th or so of the current number and put them in harder to reach, more meaningful places? I use Flan, a tiled map editor designed for Flixel. For Exploit, I just used the level editor that’s included in the game. Hmmm… an interesting games, though it feels unfinished. The coin collecting thread is just annoying, it feels like it’d take far too long to get all the coins, so it’s not worth trying.. so you may as well just hit the exit sooner rather than later as it makes no difference, except the medal. And as far as I can tell the medal makes no difference either. It does feel like there should be a final level after the 1 tutorial and 9 main ones, that gives some closure of some sort. The problem with the Naaij thread is that it takes much, much more time than the first two, and is rather frustrating. Obviously the racing goes the fastest, but the coin-collecting sticks out like a sore thumb. I think it would have felt better if there were fare fewer coins. When I started the first one, and saw there were 170-something collectibles to gather, I almost closed out of the game right there. Luckily patience won out, but the experience still broke up the flow of the game. Since there wasn’t any story-reward like there is trying to find people in Mell’s levels, it’s easy to lose motivation. I can definitely understand that. I intended that people playing the Naaij levels not need to collect every coin; I expected them to collect as many as they could easily, then come back and get 100% if they were interested in gold medals. I think my mistake was that there’s no other goal in the levels; people are much less intent on getting all the collectibles if there’s something else for them to be doing instead. I played this. Overall I was intrigued by the world and the story and the interesting movement mechanics, and I agree that the coin-collecting was overly drawn out and there were some areas that I got stuck on there, which broke the immersion for me. I would have also liked some story closure at the end. Without the closure, it does feel unfinished. I go to sleep now, and I hope to have some intriguing dreams. I thought it was quite fascinating; the world was interesting and the game mechanics enjoyable. I’m not really interested in achievements, so the coin-collecting didn’t bother me at all. I also liked the framing device, though I think that perhaps “Dream of Dead Worlds” might have been a better title; the inclusion of “babies”, while perfectly reasonable, somehow raises associations of dead baby jokes, which undermines the tone of the game. Finally, I was really hoping for another bit at the end… not something that explains everything, but something that delves further into the story of that world. But that just means I thought it was a cool setting. Yeah, I noticed people thought the title was sick or something. I honestly never expected that; the way I parse sentences means that dead baby jokes didn’t ever come to mind, although the contrast between “babies” and “dead” was intended. I didn’t think you’d meant it that way, either. “Baby Dreams of Dead Worlds” might also work better, though I’m not entirely sure. Anyway, people who get hung up on this are idiots, so you shouldn’t let them bother you. To be clear: my comment about the title was mostly nitpicking, and an attempt to explain why some people might have reacted so strongly. I wasn’t really bothered by it. I enjoyed the game. It feels so weird reading comments about the gameplay after playing it because when I played it I really didn’t think about the actual controls but was more focused on the surreal experience and story. In the same way I enjoy your other games, namely The Majesty of Colors and Bars of Black and White. Neither have very special game mechanics but the surreal stories really intrigued me. I actually probably won’t play any of these games more than once (after trying all endings in Majesty of Colors) but when playing them I felt a really cool surreal feeling. I say ‘surreal’ a lot but that’s because it’s the only word that comes to mind to describe those games. I’m finding it quite impossible to get all the coins in the third level. One of the areas near the top of the screen where there are about five or six coins is easy enough to get to, but it is IMPOSSIBLE to get out of. I’ve tried, and it’s just too far from the center to get an effect enough jump to escape. This is actually a possible jump to make. In the next version, I think I’ll move that area down one square. All I can suggest is to wait to jump until the last moment; this one really does need to be pixel-perfect. Sorry for making it so hard. Pixel perfect perhaps, but I’ve gone over as many pixels as is possible, and I think that even the high jump (holding up and while jumping) is a few pixels short on height. I don’t doubt that the distance can be made. I just don’t think that it’s possible to jump high enough to make it out. There may be slight inconsistencies in Flixel’s physics for computers with different clock speeds. Like I said, that jump’s way too precise. Finally got all the achievements! I have a question. Many of your games have a special feeling to them. The stories are quite thought through and you really get sucked into them. Like in Bars of Black and White I really thought I would go crazy, despite the graphics not looking very realistic. Do you have any specific games that you have got some inspiration from? Similar games that draw you into the story? Some of my favorite games are Knytt, Planescape: Torment, and Super Metroid. So you can take that as you will. Few of my games have very specific inspirations, though. Majesty of Colors is the exception; it was definitely inspired by I Wish I Were the Moon. I’m around like and dislike this game. From all your games, what I really like is bar of black and white, exploit, and majesty of color. Those, I feel I have to finish the game(s) because they are interesting for me. This one, although I like the characters conversation, is not as interesting of those titles. I keep playing just because I see the author’s name. I only like Mell’s part. The race discourage me by giving nothing on first run. Naaij’s part more like frustrating to me than being fun. The first conversation indicate that the character wants to collect all artifacts so I feel obligated to complete that– and immediately unable to accomplish it. Feels another discouragement. Perhaps this one missing a proper difficulty curve and some more brew of exploration– even those boards with some texts like ‘rift garden’ could make it better. Just like the others already say, the story need some closure. This one doesn’t feel like it is end, it doesn’t even feel like a hanging ending (or whatever it supposed to be called) but feels like there is a missing level somewhere. Unfortunately, my hand already cramp enough that I don’t want to repeat the levels. Perhaps it just me– the one who can’t even withstand VVVVVV demo, but I think the difficulty breaks the whole feeling conveyed in this game. About the graphic, I think I can see what you trying to perceive. By making it as simple as possible, players would be more focused to the other elements of the game and it give a lot of freedom to interpret stuffs. So, I’m sure I’m not the first one to think this.. but don’t the ehh… “Dream Bugs” resemble a betentacled phallus? 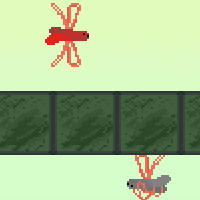 The scenery ( with these creatures living around a… gravity axis? ) somehow reminded me of Cristopher Priest’s Inverted World. I couldn’t explain the plot properly but it’s also a universe where people live according to different laws of physics. Hello. I really liked the game. I don’t think most people get this game. Admittedly I find the controls frustrating and the gameplay repetitive. But in the end these things only added to the overall message of the game. At the end of the world what does all these things amount to? All these achievements, riches, etc., what does it matter if everything you know, and everything you have, and every memory of whatever you did, would only be wiped out from existence forever. It’s a parellel to the story of our lives, our everyday, frustrating, wayward, repetitive lives, which just repeats itself generation after generation after generation. The game may not be the best I’ve played, but I think you did a phenomenal of delivering your message (or rather question) to us. Well I guess you can’t always get everyone’s praise and understanding, but you certainly have mine. Maybe not for the fun factor in the game, but for the way you used the game to deliver a very poignant message which we need to ask ourselves. Hello. I just got done playing this game on Newgrounds. It was fantastic. It really hit home with a lot of things I’ve been going through lately. I didn’t realize until after I looked at your profile on Newgrounds that I’ve played and enjoyed several of your other games as well. Keep up the good work. This is now my favorite Flash game. Except maybe VVVVVV, if that counts. I cannot get enough of alien worlds. Not sure dude. I like and I dislike. This was an interesting game. Like others, I enjoyed the middle thread the most. Oddly, the “gameplay” was almost nonexistent there, just going around and talking to people – but the story came out strongly there and really influenced the mood. The racing was ok. The coin collecting, as many others have said, was a bit annoying. Maybe if there was no total displayed until the end of the stage that would take some of the expectation off. By the last tier I really didn’t care at all. It seemed pointless – again the 2nd one was my favorite here as I had grown attached to these characters and was sad to see the whole world come to an end. Making that final coin quest seem all the more pointless – all I was looking for was a way out to end it. 75.59 seconds, 35 coins. I would normally consider this a design flaw, but in light of the central theme of the game, it is a part of reinforcing that theme through gameplay. Still, I don’t think I would play it again. I think I lost interest before that realization of ‘utter pointlessness’ from the end of the world set in – so in that sense maybe it is a design flaw, since it just felt bland. I think if the game itself was more interesting on the middle tier, and only really became pointless on the final tier, the realization might hit more strongly and the game could be improved overall. And also, thanks for continuing to put out such original games that give us pause to think. Any game that can do that is worth the time it takes to play it. An interresting Game with interresting Ideas. The story made me sad tho. But its an interresting one. I liked this game, not for its physical attributes and gameplay, but for the idea of a universal connection during infancy and the exploration of the sorrow in the death of a world. The only thing that this game REALLY lacks, is a proper ending. There should probably be a sequel to tie up this loose end of “how their world met the apocalypse”. all-in-all, i give this game 4 stars.